As of August 2016, over 9,000 cases of Zika in the United States and U.S. territories have been reported to the Centers for Disease Control and Prevention, or CDC. The virus, spread via the Aedes mosquito, can cause fever, rash and muscle pain, and also causes microcephaly in fetuses. Medical professionals, epidemiologists and virologists are racing to find a cure, despite obstacles in funding. In July 2016, Nature Structural & Molecular Biology published a landmark article by the Janet Smith Lab at U-M that describes the molecular structure of a Zika virus protein called NS1. The protein impacts both the reproduction of the virus and the immune system of its host. 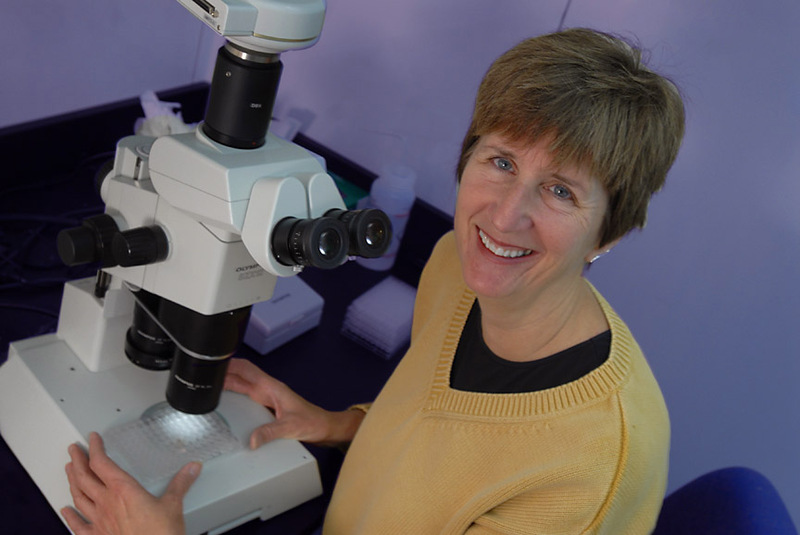 Smith, Ph.D., a professor of biological chemistry, and her lab found features of the NS1 protein that distinguish it from proteins of other viruses — a potentially crucial discovery on the path to finding a vaccine. Medicine at Michigan recently spoke to Smith, also the Margaret J. Hunter Collegiate Professor at the Life Sciences Institute, about the outbreak and her group's scientific contributions. When did your team begin this research? We’ve been studying proteins from flaviviruses (dengue, West Nile, yellow fever, Japanese encephalitis) for several years. Our latest work has been on a virulence protein called “NS1.” Zika was considered a minor and relatively harmless flavivirus until the Brazil outbreak in late 2015. We began work on the Zika NS1 protein when the seriousness of the outbreak became apparent. The flaviviruses are very close relatives — their molecular details are highly similar. How does Zika differ from other mosquito-borne illnesses like dengue and West Nile? How is it similar? The diseases are strikingly different because the viruses infect different cell types. For example, it appears that Zika virus can cross the placental barrier and infect developing neural tissue in the fetus. How Zika infection is connected to Guillain-Barré syndrome [an illness in which the immune system attacks the peripheral nervous system, causing muscle weakness] is even more poorly understood. Despite the nearly identical molecular properties of Zika and other flaviviruses, these disease associations are unique to Zika. What do your findings indicate about the interaction between the Zika virus and its host? Inside infected cells, the NS1 protein is needed for replication of the viral genome, but NS1 is also secreted into the bloodstream of infected people, where the immune system produces antibodies to it. The “face” of Zika NS1 that’s seen by the immune system has features that distinguish it from the NS1 of dengue and West Nile viruses. We don’t yet know exactly which host proteins and cells interact with NS1. How can knowledge of NS1's structure influence the creation of a vaccine or treatment? The most immediate application of the NS1 structure would be to develop a diagnostic test that’s specific for Zika. The most economical standard tests of serum for recent Zika infection are compromised because there’s substantial cross-reactivity of dengue-induced antibodies with Zika proteins, so a positive result in a Zika antibody test is not definitive — secondary tests are needed to rule out infection by another flavivirus. Pregnant women and couples contemplating pregnancy face life-altering decisions that should be based in accurate information. It would be great to develop a more Zika-specific diagnostic test based on a region of the Zika NS1 surface that differs from the dengue NS1. Although Zika has been known to virologists since 1947, it only began spreading in the past decade. How do you accelerate research to catch up to a virus that’s evolved into a pandemic? Research began accelerating as soon as the connection to microcephaly was identified in the Brazil outbreak. Virologists and other researchers are highly motivated to address the public health crisis by understanding Zika infection well enough to develop an accurate diagnostic test, a vaccine and drugs to treat infection. There’s an unprecedented sharing of research results as researchers try to solve the puzzles of Zika’s unique properties. However, funds for Zika research are limited. President Obama redirected $600 million from other programs into Zika research, prevention and treatment when Congress declined to provide additional funds for Zika research and public health efforts, but this is a short-term stopgap. What challenges did you face conducting this research? We faced many technical challenges in obtaining the first structures of NS1 from dengue and West Nile viruses: how to isolate the protein so we could study its structure, how to determine the structure. We applied the lessons from dengue and West Nile NS1 proteins to the Zika NS1, and rapidly got its structure. At present, our greatest challenge is to fund the research at a level that will lead to understanding NS1’s many functions and to applying it to develop diagnostics or vaccines. In your experience, what can Zika teach us about how viruses spread, and about how societies respond to medical crises? We’re still learning the peculiarities of Zika infection: where it hides out, what cells it infects, how frequently infection during pregnancy leads to damage of the fetus. The Zika outbreak has received strong attention in the research community and an unprecedented sharing of results to answer important questions as quickly as possible. I think this is a result of the changing international response to medical crises, which has evolved enormously starting with the SARS outbreak in 2003, through annual concerns about flu, through the international response to the 2014 Ebola outbreak. There’s a growing willingness of public health groups to work together and a growing understanding that the challenges transcend politics. Although the Zika outbreak is now affecting the developed world, it’s important to remember that dengue virus is a far more serious international public health problem, as more than 300 million people are infected annually (according to the World Health Organization). Some of the discoveries about Zika virus will impact our understanding of dengue virus pathogenesis, just as knowledge of dengue and other flaviviruses provided an excellent jump start to understanding Zika virus.